US sailors guided an F/A-18C Hornet assigned to the Valions of Strike Fighter Squadron 15 on the flight deck of the US aircraft carrier USS George H.W. Bush in the Arabian Gulf on Friday. 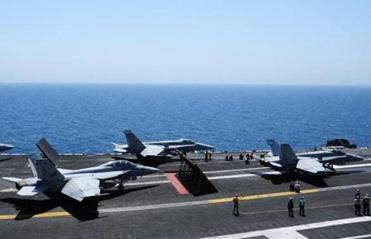 DOHUK, Iraq — The United States launched Friday afternoon a second round of airstrikes on Sunni militants in northern Iraq, sending four Navy fighter jets to strike eight targets around Irbil, according to Pentagon officials. The attacks came hours after an initial wave of strikes by military aircraft and armed drones, escalating the U.S. involvement in Iraq a day after President Barack Obama announced that the U.S. military was returning to a direct combat role in the country it left in 2011. Defense officials said they believed the second round of attacks resulted in a number of casualties among the militants with the Islamic State. 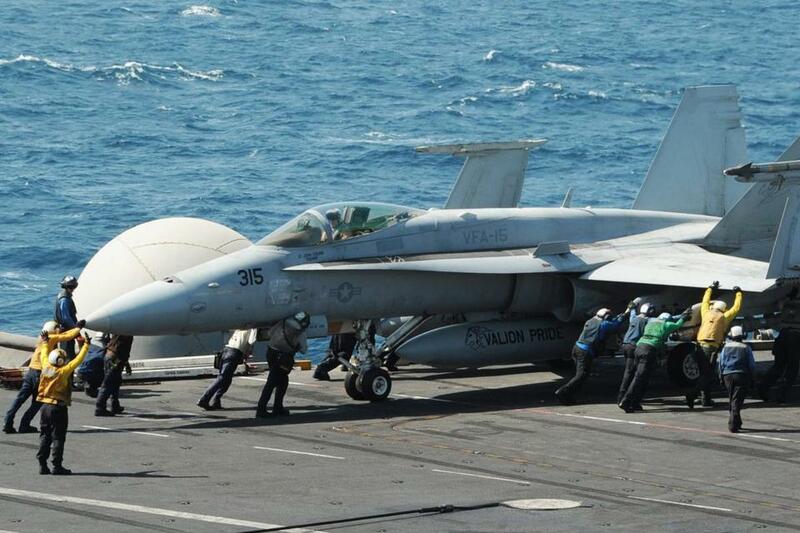 The Navy fighters launched from the aircraft carrier U.S.S. George H.W. Bush, which has been deployed in the Arabian Sea. Earlier Friday, two F-18 fighters dropped 500-pound laser-guided bombs on a mobile artillery target that had just begun shelling Irbil, Pentagon officials said. A senior defense official said Friday that the artillery unit hit in the earlier bombing was being towed by a truck toward Irbil. RELATED | Evan Horowitz: Why did Obama OK airstrikes against militants in Iraq? Read: Horowitz: Why is US dropping bombs? Obama said Thursday that he had authorized airstrikes if necessary to break an Islamic State siege that has left tens of thousands of refugees stranded on Mount Sinjar in northern Iraq. So far, all of the military bombings have been carried out at targets near the Kurdish capital, where the United States has a consulate and where thousands of Americans live. Defense officials said that they expect the strikes to continue as warranted, as part of an effort to slow the momentum of Islamic State militants, who had accelerated their march on Kurdish targets in northern Iraq. Kurdish officials said the first round of U.S. bombs struck Friday afternoon in and around Makhmour, a town near Irbil. They reported an airstrike in the same location Thursday, before the president’s announcement; the Pentagon denied that U.S. warplanes carried out that earlier attack. Kurdish fighters, known as peshmerga, have been hard pressed in recent days by the militant fighters, who have seized several towns near Irbil from the Kurds and took the Mosul Dam, one of the most important installations in the country. The airstrike appeared intended to help stem the tide. “The airstrikes are being led by the USA, and peshmerga are attacking with Katyusha,” said Halgurd Hekmat, a spokesman for the Kurdish fighters, referring to a type of Russian-made tactical rocket. Many members of religious minorities in northern Iraq, including Christians, have fled to Kurdish territory to escape the advancing militants, who have imposed harsh fundamentalist rule in areas they control. Others have been trapped and besieged by the militants, including tens of thousands of Yezidis, who follow an ancient faith linked to Zoroastrianism and are stranded in a mountainous area to the west. Delivering humanitarian aid to that group is one of the purposes of the U.S. operations in Iraq, Obama said. Britain, a close ally and coalition partner of the United States in the wars in Iraq and Afghanistan, said Friday that it would not take part in military action there now but would provide humanitarian aid and technical assistance. Turkey, a NATO ally that borders northern Iraq, said Friday that it, too, would step up humanitarian aid to the region, news agencies reported. The Federal Aviation Administration, citing “the hazardous situation created by armed conflict,” instructed U.S. air carriers on Thursday not to fly in Iraqi airspace until further notice. Turkish Airlines said it had suspended service to and from Irbil indefinitely. The leader of the militant group sent a defiant message to the Americans in an audio statement posted on Twitter. “I address this message to America, the holder of the Cross,” wrote the leader, known as Abu Bakr al-Baghdadi. While Kurds welcomed Obama’s announcement of U.S. assistance, the reaction in Baghdad was mixed. “They should have provided Iraq with weapons,” he added, possibly an allusion to the U.S. suspension of deliveries of F-16 fighter jets and Apache helicopters to Iraq. “They should have made this decision when hundreds of Shiites and Sunnis were being killed every day,” he said. “Iraqis must rely on themselves and their genuine friends like Iran and Russia, who have supported Iraq in its battle against ISIS,” he said, using another abbreviated translation of the Islamic State. Russia has sent Sukhoi helicopters to the Iraqi forces, and Iran has trained and financed militia forces and sent advisers. The decision to announce U.S. air operations Thursday appeared to reflect a view among Kurdish, Iraqi and U.S. military leaders that a crippling attack by the militants was more imminent than was widely recognized. The militants’ seizure of two towns within 20 miles of Irbil, which serves as the Kurdish capital, precipitated panic in the capital and the beginnings of an exodus of residents to Sulaimaniya, the largest city to the north. Military leaders believed that if the city emptied, it would be much more vulnerable to an militant attack, officials said privately, asking not to be quoted because they did not want to shake morale. The bombing appeared to bolster morale in Irbil on Friday, at least temporarily, according to people there. Fewer cars could be seen at the city gates attempting to leave, they said. “The bombing changed the mood of the people,” said a peshmerga officer. Why are we dropping bombs in Iraq? Ideas: What is the Caliphate, exactly? A primer.